So, being my first community post, I'm not exactly sure how this works. Anyway, if anyone has any information on a Swampert plush being offered, it would be greatly appreciated! Can anyone give me any information about this little guy? What's the actual plush name, any cool facts about it like "this was the first koffing plush toy ever made", "this got banned in x country because they thought kids might choke on the beans" or just "this is the most unremarkable pokemon toy and there's nothing interesting about it"
The plush I got has its little soft tag still attached, but no cardboard tag - I identified it by the eyes in the picture, so if there's another with the same expression how do I tell them apart? Also, I do have some kids left from the November (Kimewaza BW3 Set). The price on these is $7, plus SHIPPING. Please comment below for a quote on these! Thanks! Hello there! I am brand new to LJ, and I joined so that I could be a part of this community! (I've been stalking this community for a good month or so, and I'm really excited to finally join ^o^) My Pokemon experience started when my cousin sent me her purple Gameboy Color with Pokemon Blue and Pokemon Red. I started playing through Pokemon Blue, with my trusty Blastoise (I never trained my other Pokemon ^.^), and was instantly enamored of the world of Pokemon! Ever since then, I have been purchasing murchandise and playing as many of the games. (I currently own Blue, Red, Pokemon Pinball, Fire Red, Emerald, XD Gale of Darkness, Colosseum, Diamond, Pearl, PMD blue, PMD sky, all the ranger games, both Pokeparks, Battle Revolution for Wii, Black, White, Conquest, AAAND finally, White 2!) Boy, that's quite a list! My favorite Pokemon in the entire world, if you couldn't assume from my username, is Snivy! I absolutely love everything about the Grass Starter. Snivy and its evolutions are what make up most of my collection. I have recently started collecting Espeon as well! When I heard about the insane amount of Eeveelution products coming from Japan, I knew that I should begin a collection of my favorite one! I chose Espeon because I love her purple fur and beautiful eyes. I suppose that's a good introduction, I better show off my collection before I ramble on any furthur! This is my first post, so if I did anything wrong please tell! If you have any tips for a newbie like me, please share! Thank you for taking the time to read this post! :-) I hope my time with this community is a positive experience! Christmas is coming so it's time to make some wants! That's all! Every zukan I don't have will be considered, so please let me know what you have and your asking prices! Did a comm member win this settei lot that just ended on Y!J? If so, I would be very interested in talking to you about the Burgundy Settei in there! I'm also still searching for th Erika TFG, Movie 9 clearfile, Captain Phantom and Ash Gashapon figures, and Azurill plus - if you have any of these please let me know! Also kriscarmi and jr890, please check your PMs! I need your final payments for the DP11 GA so I can get your Zukan shipped out. 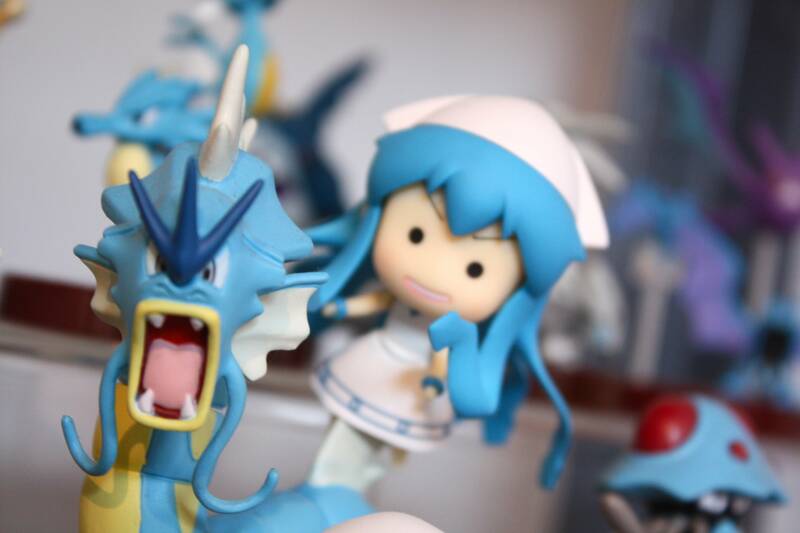 Finally, not sure how many of you Musume, but she found a good perch on Gyarados! This isn't a very traditional christmas photo, but I thought it came out pretty well and unique so I thought I'd share. :3 Lots of updates coming soon! But if I don't post again before the New Year, happy holidays everyone, and here's to another good year of collecting! 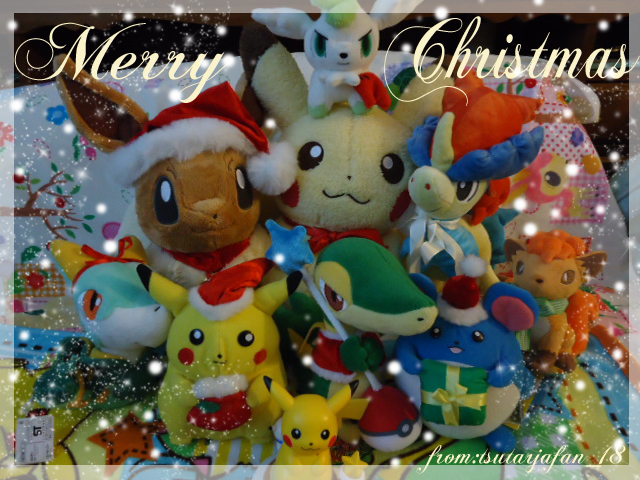 Wishing Everyone a "Merry Christmas"
HQ Eevee "Evia" made it to my home before Christmas, HQ Pikachu wanted to get him for awhile, Shaymin sky=Christmas pokemon to me, Keldeo (got to go to Japan and see his movie this year), Tsutami the Serperior for getting White 2 this year (newest get), Midori the vulpix..just for being utterly adorable X3, and the rest of the gang wishing everyone a wonderful Christmas. I know there are some official ones out there. Such as these more recent ones from the Pokemon Center. 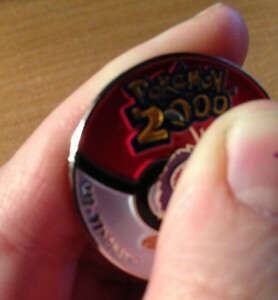 I also know of ones that come with pins of the badge, the gym leader, and one of their Pokemon. Such as in this image. I don't know anything about these really, but they apparently come with a VHS. Sunnyshore also has these really expensive great badges that come in a box. Then of course, Sanshee has some attractive badges. 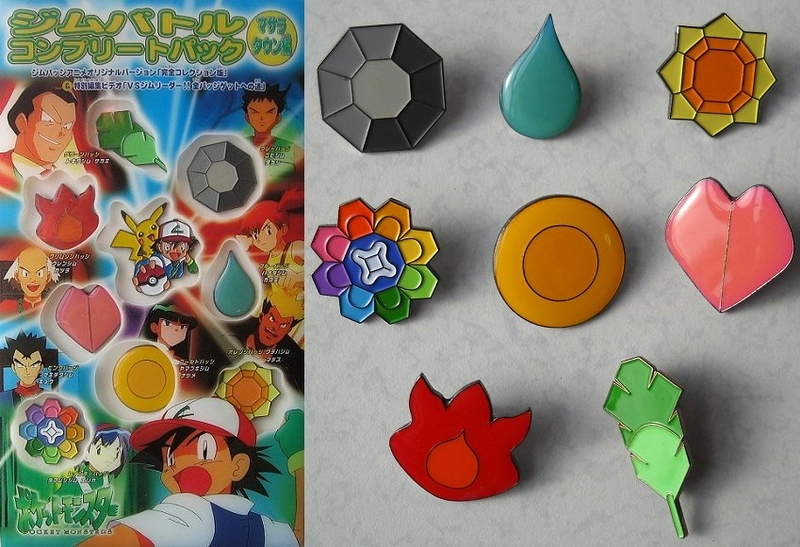 I'm sure some of you pkmncollectors have gotten the above badges. I'm curious mostly about Sanshee's and Sunnyshore's badges. Have you bought any? If so, was the quality satisfactory? Any other info you'd like to share? I'm not sure if this is the right place for this, but my sister gave me a Jakks Oshawott figure for Christmas and I already have one, so I'm planning on repainting its shiny variant, but I'm not sure which colors I would need to do so. I'm new to the comm... long time watcher first time joiner kinda thing. I am a collector of zukan, and as such have a few wants and stuff, and I'm full of questions and ideas too. basically, there's a few special needs, the "holy grails" as such, but I'l get round to that later =]. Firstly, can anyone tell me how to put photos on here, cause I naturally want to show off my collection. Does anyone have a pidgey zukan they dont want? or the full set? I have Pidgeotto and Pidgeot but unfortunately Pidgey decided to fly south and never returned. Also I'm looking for Zapdos, and any starter pokemon sets apart from the new ones. I hope you will all accept me as a member of this. well I have no idea if the morning before christmas is a good or bad time to try to sell toys! a little late probably, but hey we have a ton of international users (and people everywhere celebrate many holidays!) here so any time is the right time! click the picture for the sales post! I think I might be doing something wrong with the cut because it is not linking to the page right? I saw this, and I find it extremely interesting, and would love to have in my room. EDIT: I'm adding 5 more slots for NON metagross pick ups. So many people want metagross but he most likely will be sold out! I have 2 more slots open for Epcot pick ups for when I go this Wednesday. I just found out that they have Reshi, Zekrom and Black and White Kyurems oversized pokedolls ($50 each), B&W Pokedolls ($25 each) and Tomys ($10 each). Sorry about prices guys :/ It's disney so it's pricey. At least shipping is from the US as opposed to Japan though so you save there!